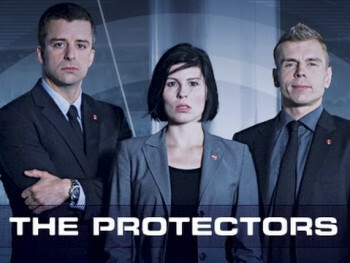 The Protectors is a danish TV Series that premiered on DR1 in january of 2009. The series is written by Mai Brostrøm and Peter Thorsboe and is the last and final part of their crime trilogy consisting formerly of Unit One (2000-2003) and the Eagle (2004-2006). The series won an International Emmy Award in the category for 'Best Drama' in 2009. The Protectors centers around characters Jasmina el Murad (Cecilie Stenspil), Jonas Goldschmidt (André Babikian) and Rasmus Pulsen (Søren Vejby) and their work as life guards for the danish secret service (PET).